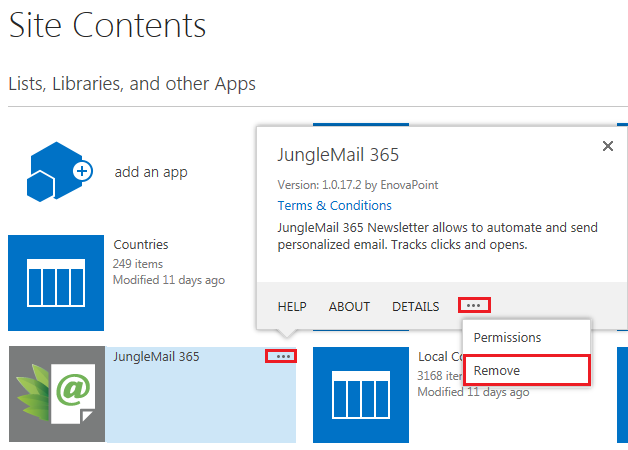 If you no longer need the JungleMail for Office 365 app on your site, you can remove it by going to the Site Contents page. Note: to remove an app, you must have Full Control permissions (Site Owner, for example) for a SharePoint site. On the Site Contents page, find the JungleMail 365 app you want to remove and click the ellipses (. . .) to view the app properties. Click Remove on the menu.